Last year I entered a blog contest over at The Chatty Momma for one month of Jenny Craig which included weekly one-on-one consultations with a dedicated consultant who would help identify challenges, map out goals and track my progress as well as a one month supply of food. Shout out to Tonia for the amazing giveaway, it really helped me get a good running start to re-vamping my Lifestyle Choices when it comes to meals and portion control. That was my first ever intro to Jenny Craig, I had never tried a program like this prior to this experience and I am happy to report I was successful at losing weight with the program - Members following the Jenny Craig program on average lose 1-2 lbs. a week. Out of the four weeks, I had only one 'un-successful' week and it is because I didn't stick with it, I was away from the meals most of that week because of my insane schedule - that is the only week I gained, not much, but it proved without a shadow of a doubt that if you stick to it, the program really does yield results. I wasn't just 'out and about' I was traveling so I couldn't take the food with me, if only this kit had been available then, I could have just purchased one when I landed! For the truly observant you may notice my kit accidentally contained 4 dinners and 6 lunches but if that happens to you don't worry you can substitute - I just used one of the lunches for dinner. and one of the things I love about the program is that you can add a salad to any lunch or dinner - now just remember, it's NOT the salad that does folks in, it's the dressing - the plan comes with a pre-portioned balsamic dressing that I really love. They also offer 'anytime' items. Ƹ̵̡Ӝ̵̨̄Ʒ - The fact that this kit does NOT require refrigeration and can be stored at room temp makes it perfect for my 'cubicle chicks' - no worries about stuff disappearing from the office fridge. (In my younger days I worked on a Trading Floor and lunches constantly disappeared from the Fridge - not cool, especially in winter!) - Just store them in your desk and you have all your meals literally at your fingertips. And with having the dinners with you, if you work late, you are covered and don't have to worry about being starved by the time you get home. Ƹ̵̡Ӝ̵̨̄Ʒ - Hate meal planning? - BOOM, this kit plans for you - it literally doesn't get easier than that. Ƹ̵̡Ӝ̵̨̄Ʒ - Hate shopping for a ton of ingredients you don't end up using or having food go bad? Not going to happen with this kit. With me being a single gal in the city with no kids I don't want to prepare elaborate meals just for me - lunches especially - I don't have time for it, so this is absolutely perfect for me. I also tend to skip breakfast if left to my own devices, this system helps me start my day with something in my system making me less likely to snack before lunch and give me more energy. PERK! Ƹ̵̡Ӝ̵̨̄Ʒ - Even as a SOHO (small office/home office) I love that I can always have something portion controlled, healthy and TASTY at my disposal. They are super fast to prepare which is perfect and some of the lunches that don't even require heating like the salad kits (chicken or tuna salad with whole wheat crackers and apple sauce) can be tucked into your purse for a meal on the go so you are less likely to cheat while out. Ƹ̵̡Ӝ̵̨̄Ʒ - I am a grab and go if at all Breakfast person - the chocolate dream shake is PERFECT, but it is not included in this particular kit (I am at an advantage and dis-advantage that I am familiar with the entire range of meals offered and have my favorites!) I do wish this five day kit included the shakes as the shakes can also be used for a boost mid-day if you are craving something and are far from your next meal time, the shakes are considered 'anytime' items (as well as many of the bars like the Chocolate Peanut Butter Anytime Bar). Nothing to count, just follow along the menu plan and it outlines how to incorporate anytime items into your day. Ƹ̵̡Ӝ̵̨̄Ʒ - Now I don't know if all the kits are like that, but I wish mine hadn't repeated meals more than once, and had given me total variety with something different each day but I have a feeling that most of the other meals are ones that require refrigeration so that is why they weren't included. Now I know what you are thinking butterflies, "but butterfly if the program worked for you, why didn't you stay on it longer than the trial month?" Good Question, simply put the weekly meetings were really hard to fit into my schedule. I am a Life Coach, Social Media Consultant, Freelance Writer and Blogger and commuting to the city as there is no branch closer to me just for the consultations got harder and harder to schedule, now that the kits can be picked up at MY convenience I can see myself picking it up again to jump start my way into Spring and get myself back on track eating wise and portion control wise. Also, with the beverages, hauling the food from the branch to my home as someone who does not drive and was taking public transportation was also a challenge for me, this kit is way lighter and much more compact and can be picked up during a regular shopping trip closer to home so it's a total win/win in my book. Ƹ̵̡Ӝ̵̨̄Ʒ - Breakfast Faves: Egg, Cheese & Turkey Sausage Burrito, Florentine Breakfast Pizzas (Whole Wheat Crust, Scrambled Egg White, Spinach and a blend of cheeses and BACON, yes Bacon!) and for me I used the Chocolate Dream Shakes often for Breakfast as well. Ƹ̵̡Ӝ̵̨̄Ʒ - Snack Faves: Bruschetta Veggie Chips, Black Bean Taco Chips, Chocolate Lava Cake and Gold Stars to the Triple Chocolate Cheesecake! When following the program, I lost just under 2 pounds per week each week, so I hope that the new kits at Walmart will also be made available soon at Walmart.com because having it delivered right to my door would definitely make an already good thing - that much better! What say YOU? Do you shop at Walmart? Will you be making a bee line for the diet/weight loss aisle to try the new Jenny Craig 5 day Weight Loss Starter Kit exclusively at Walmart? The Ground hog says Spring is coming early and you know what that means - summer isn't far behind! FTC Disclosure: This is a sponsored/compensated Post in conjunction with Acorn Influence and Walmart, however all opinions are 100% my own! The Weight Loss and The Love Is Real Folks - Portion Control really is KING. I am disclosing this in accordance with the Federal Trade Commission 16 CFR, Part 255 - Guides Concerning the use of endorsements and testimonials in advertising, you may check our Giveaway and Disclosure Page for additional information regarding Ascending Butterfly Disclosure. Check with your Doctor before starting this or any weight loss program. Some meal/snack items contain tree nuts, read ingredient labels carefully before purchasing. I have heard great things about this program. I have a few friends that have been successful on it. I love the idea of the meals already done and all I have to do is grab them. I REALLY love that they are healthy for you! I tried Jenny Craig and really liked it. The convenience was a big factor but the food also tasted pretty good. I have been trying to eat healthier and workout. This might be a good option to help me stay on track. Thanks for sharing. 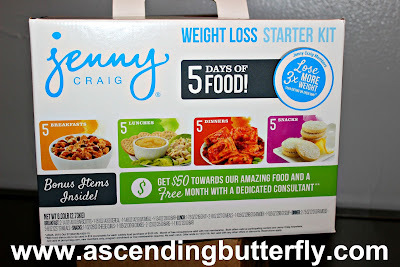 I have never tried Jenny Craig before, looks like a great program to try! I know it's time for me to take better care of myself and time to take control of myself ; this sounds like an ideal way to do it Thanks for sharing and good luck to all of you that are trying to get a grip on your eating habits ! !well Jenny Craig here we go !!!!!!! I have heard great things about Jenny Craig and I'm glad you found so many items so tasty! I definitely have my own snacktime danger zone and it gets me all too often! A friend of mine uses Jenny Craig and she attested ti how effective it is for her weight loss journey. I think changing portion sizes is what really either makes a diet work or not work. That is why programs such as this work for many people. Because you only get to eat what is delivered to you, assuming you do not load up on stuff that is not on the plan. I've had friends who've done quite well with Jenny Craig. They advocated listening to your coach, carrying approved snacks all the time, and no cheating. Willpower is definitely a good thing. Jenny Craig is absolutely a great product. It is very convenient to use and it is very effective. Thank you! I've been hearing a lot of great things about this program. This makes me curious to try it out. I really, really appreciate your reviews. You are always fair, balanced and detailed. People who I know that have done Jenny Craig really love it. I've heard a lot of great things and success stories surrounding Jenny Craig. I wish you luck with your weight loss journey. I am intrigued by the idea of doing a program like this one, where all of your food is already planned out. My issue right now is family dinners. I don't want to give my kids the wrong idea by eating a different meal than them. Do you think it would still be effective if I ate just breakfast and lunch from Jenny Craig, but ate our family dinners as usual? I am going to try these! They look like they have so many great options, and it makes meals quick and easy. I struggle with meal planning, so prepackaged meals get a thumbs up from me! Jenny Craig has some healthy-looking snacks. My wife tried Weight Watchers for a while and did well with it. 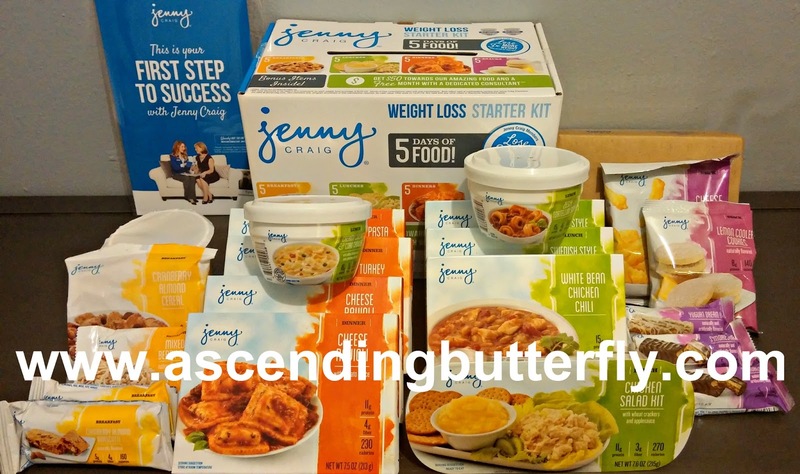 I have tried Jenny Craig before and was disappointed that I had to spend so much money on both their food AND groceries. It was just too expensive for me. I have never tried Jenny Craig before. I've always wondered about the food though. Sounds like they have some pretty good stuff. I always struggle with meal planning, so something like this would be very helpful. Just have to stick with it and be sure to discipline yourself! Definitely easier said than done, but it will be worth it for a healthier lifestyle! 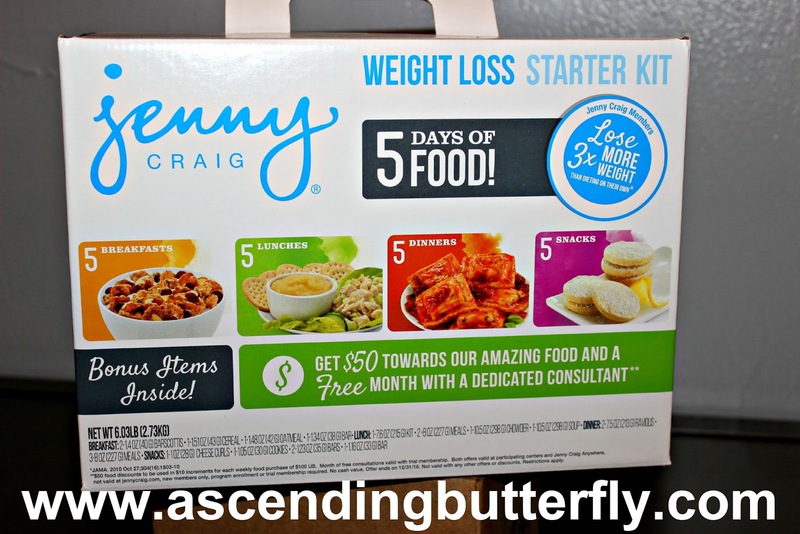 I have never tried Jenny Craig before, but I have heard nothing but good about this program! It's nice that they came out with this weight loss starter at such a budget-friendly price. I had no idea they had a starter package. I can't wait to see your results from it. I know a lot of people that have had success with this. It looks great and the meal sound awesome. I have tried many popular weight loss programs, but I have never tried Jenny Craig. I have always wanted to. I love that this is available at WalMart, making it affordable and accessible. I'll have to keep my eyes out for this! Just the kick in the pants I need right now! My mom had great success with Jenny Craig. The convenience and pre-portioned sizes take all the guesswork out. It's great you can grab a starter set so easily now. I'm glad that you are enjoying the Jenny Craig program. I do not use Jenny Craig but I do meal plan and I have found it helps so much in sticking to a diet and losing weight. Portion control and making the right food choices will help you lose weight. Starting with a program that works for you can really be helpful to train your brain. I've heard a lot a great things about Jenny Craig. That looks like a great starter kit. This is the first time that I am hearing about Jenny Craig but I must say that this kit / set is very convenient. It would be perfect for busy girls like me. That is so great that Jenny Craig have made it so simple to get started. Looking forward to seeing your progress. I definitely think these programs work...however, I think keeping up with it when you're done the program is the hardest part! The Jenny Craig program has been here forever! I will have to go check my Walmart to this if they have the 5 day weight loss starter kit. This sounds pretty great. I hate meal planning myself!